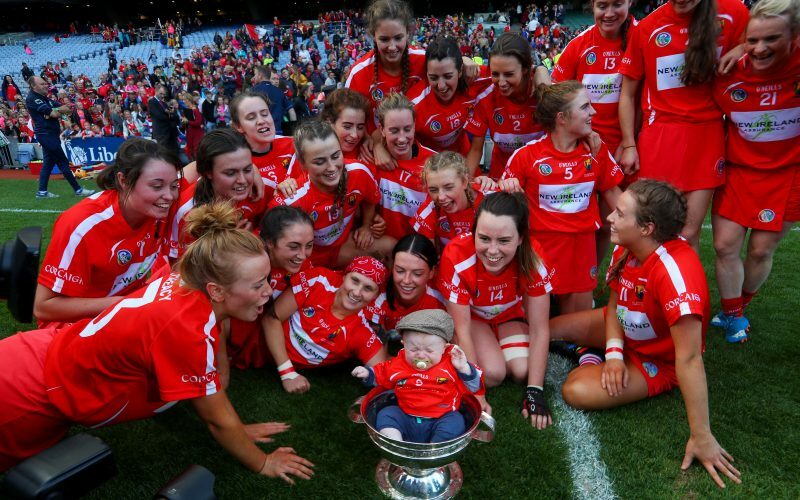 A 61st minute Orla Cotter point was the difference as Cork captured their 28th Liberty Insurance All-Ireland Senior Camogie title after a titanic finish ended with a 0-14 to 0-13 win over Kilkenny at Croke Park. 12 months ago at the same venue Cork prevailed by the minimum margin, and once again Paudie Murray’s charges delivered following a tight finish, which saw the sides twice level in the closing three and half minutes of normal time, before Cotter’s injury-time winner. Kilkenny had a chance to send the game to a replay, but an effort from Claire Phelan went wide from the resulting puck-out, and despite a further two minutes being played, over the at least two minutes of injury-time announced, Cork held out. This was a superb game of Camogie, once again reflecting the calibre we have come to expect from these counties in recent years. The sides were level on eight occasions throughout, equally split in each half, with Kilkenny quickest off the blocks. The seven-time winners registered the opening points after just 18 seconds with Michelle Quilty on target, but it took over 13 minutes for them to register their next score. Cork firmly got to grips with this game, and with some excellent free-taking pushed 0-4 to 0-1 ahead after 12 minutes. Chloe Sigerson levelled matters, before the first of five points over the hour from Orla Cotter who was outstanding throughout. Cork were awarded a seventh minute penalty after referee Eamon Cassidy consulted with his umpires after Amy O’Connor and Denise Gaule became entangled close to the post, as O’Connor bore down on goal. Captain and goalkeeper Aoife Murray blazed the resulting effort between the posts, as Cork moved two points clear, before a second Cotter effort extended their lead. Kilkenny then hit a bright patch with a brace of Gaule efforts, before a Julie Ann Malone score to tie the game after 18 minutes. A second pointed free from Sigerson was Cork’s first score in 11 minutes, before Katrina Mackey’s opening point, after Kilkenny keeper Emma Kavanagh failed to control the ball handed Cork a two-point lead. Both sides had purple patches in the closing stages of the half – a brace of Gaule pointed frees levelling the tie, before two further scores from the Windgap sharp-shooter opened up a two-point lead as injury-time approached. However, Cork made the best of injury-time and with a brace of Orla Cronin points the sides were tied 0-8 apiece at the interval. On the restart there was little again to separate the sides as Cork drew first blood with Mackey’s second effort. Cork pressed hard but were met with some Kilkenny resistance, with all of the Rebels half-forward line combining, before Claire Phelan put in a superb block on an Orla Cotter effort. Kilkenny introduced Miriam Walsh in a bid to strength their attack, and with Cork continuing to foul Kilkenny players in key positions, and Gaule pretty good from placed-balls this game continued to be tight. A 43rd minute effort from Gaule did drift wide, but she made amends soon-after, as along with an Anna Farrells core the sides were tied after 50 minutes. With the wind proving tough an Orla Cotter effort also drifted wide, before an Aoife Murray double-save which really was a turning point in this match. Firstly Murray denied Katie Power with a fine block, and then was on hand to block an effort as Miriam Walsh tried to bundle the ball to the net. Kilkenny managed a point from the resulting 45′ through Gaule, for her ninth score of the game, but Cork worked hard defensively late on. Upfront Amy O’Connor and Sigerson added fine points, and although Gaule drew the tie once more, Cork dug deep to deliver Cotter’s winning score. Scorers for Cork: Orla Cotter (5f) 0-5; C Sigerson (3f) 0-3; K Mackey, O Cronin 0-2 each; A Murray (pen), A O’Connor 0-1 each. Scorers for Kilkenny: D. Gaule (7f, 2 45) 0-10; M Quilty, JA Malone, M Farrell 0-1 each. CORK: A Murray; P Mackey, L O’Sullivan; L Treacy; H Looney, L Coppinger, C Sigerson; A Thompson, G O’Connor; J White, O Cronin, A O’Connor; K Mackey, L Collins. Subs: L Homan for Collins (50); N McCarthy for A O’Connor (64). KILKENNY: E Kavanagh; C Foley, D Tobin; A Dalton; G Walsh, C Phelan, J Clifford, C Dormer; M Farrell, D Gaule; JA Malone, M Quilty, S Farrell; A Farrell, K Power. Sub: M Walsh for Quilty (35).